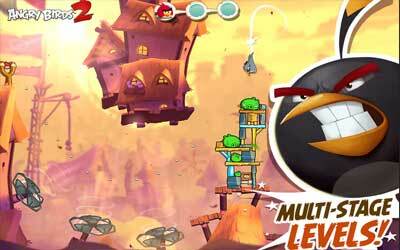 The latest Angry Birds 2 2.2.1 APK has been released by Rovio. They bring great game, with many fans and very popular in the previous sequel I think this version will get many users too. Still with the same gameplay concept, in this game you will return to play catapults with the birds as bullet character. Each birds have different strengths, such as Red can emit puff of air, Chuck can dip sharply, the Blues were able to break itself up into three, etc. It is not just support or power-ups in the game, you just have to think the best strategy: character of birds that should be used on the first shot, the second, and so on. New levels! Get in there and pop some pigs in a gaggle of new slimy and slippery levels. Pro tip: bring tissues. New player profiles and friends leaderboards! Tap the avatars of your friends and competitors to see their profile complete with their birds’ levels and other stats. Music and its play style is pretty good. It works finely on my device after update.